Color(s): Pure White, without any patches or any shades of white. 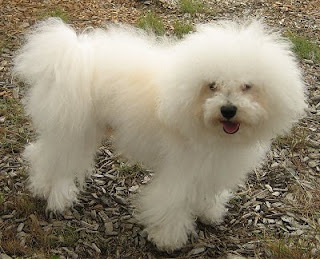 The Bolognese is a small breed of dog which is closely related to the Havanese and Bichon Frise. It emerged in Italy and even the name refers to the northern Italian city of Bologna. This breed was often given as presents to Belgian Royalty and it almost vanished with the passing of nobility. However the breed was revived by Gian Franco Giannelli but still remains rare worldwide. They were and remain an intelligent and affectionate companion. The life span of this breed is 12-14 years. This is one of the healthiest breed with no inheritable diseases or other health issues.